Between 2015 and 2016, Polygone shopping mall underwent a comprehensive renovation project aiming to exploit its urban location and shopping vitality. Hinging the historical city- centre and the Antigone neighbourhood, Polygone shopping mall hosts a multi-storey parking, a semi-public linkage connecting two different urban levels (Passage Hermès), four anchors in correspondence of the entrances and several shops. The refurbishment project consists in a structural uplift of the historical building and city landmark, taking a step ahead of previous renovation initiatives carried out during the 1990s. 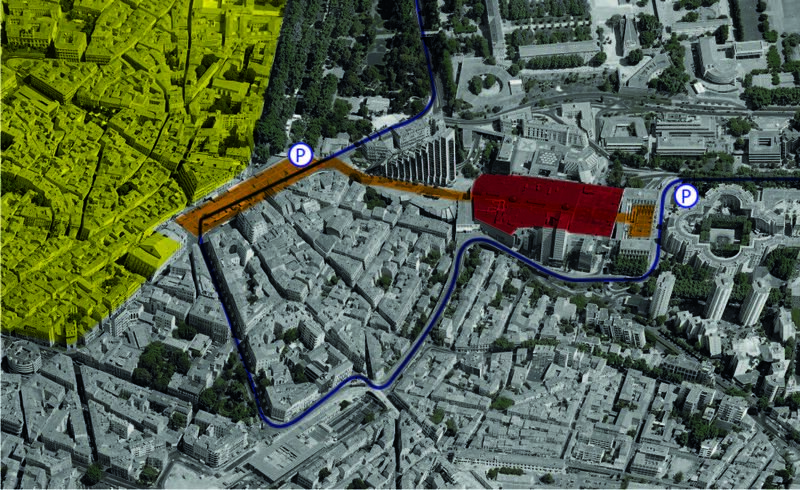 Within this framework, Systematica is appointed by Socri (Syndicat des Copropriétaires du parking-centre commercial Polygone) to investigate the mobility issues of the project. The study focuses mainly on pedestrian mobility by analysing the vertical transportation efficiency, the escalator distribution and capacity, the intelligibility of the circulation patterns for both the current and proposed configurations. In order to meet the expected redistribution of visitors across the three levels of the shopping centre, two alternative scenarios are conceived and discussed with multi-criteria analysis done for their verifications. Sophisticated analytical tools, namely Elevate 8 and Space Syntax software, are used in order to verify the effectiveness of the proposed solutions. Sophisticated tools are used to develop multi-criteria analyses on the proposed alternative project scenarios.